It would be hard to classify the wider world's 2016 as anything other than an annus horribilis, but this blog—and my creative projects in general—certainly enjoyed many bright moments during the past year. Many people are born at the wrong time. Picture a woman with the mind of a brilliant particle physicist, forced to labor as a peasant in the Middle Ages, or a man as strong as Rome's greatest gladiators, slouched behind a guard's desk at a modern-day office park. In contrast, I consider myself among the lucky few in history to be born in an era when I can flourish. Coming of age at the cusp of the 21st century, the great age of globalization, I am tech savvy, multi-lingual, curious about other peoples and cultures, and eager to travel. I have constructed my globalist identity just as humanity has rapidly grown more interconnected than ever before. Consequently, as I have emerged as a cosmopolitan "citizen of the world," I have enjoyed the feeling that I am swimming with the current—that I have the right skillset and mindset to thrive in precisely this historical moment. 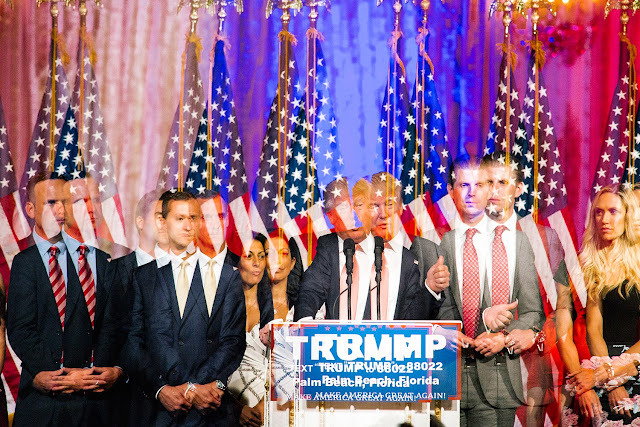 I also continually see more globalists emerging all around me; whether by push or pull, globalization seems to swell our numbers more with each passing year. Sure, I told myself, there's still plenty of people who aren't so interested in embracing the fast-arriving globalized future—and even some who are downright hostile to it—but overall our side is winning. Shortly after last week's live interview on French TV, an Algerian friend and TV host, Younes Sabeur Chérif, invited me to appear on his morning show—Algeria's most popular one—Echourouk Morning. My primary concern as I weighed his offer was the language: this one would be in Arabic. Thank you to all my Arabic teachers—both official and unofficial ones. 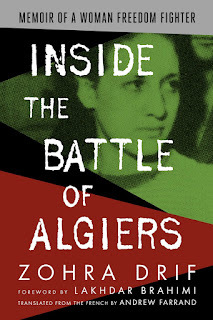 My thanks also to all the Algerians who have written to share praise and gratitude. Last month I spent Election Night at the US Embassy here in Algiers, giving live interviews on several Algerian TV stations in which I confidently predicted that common sense would prevail and deliver a Clinton victory. 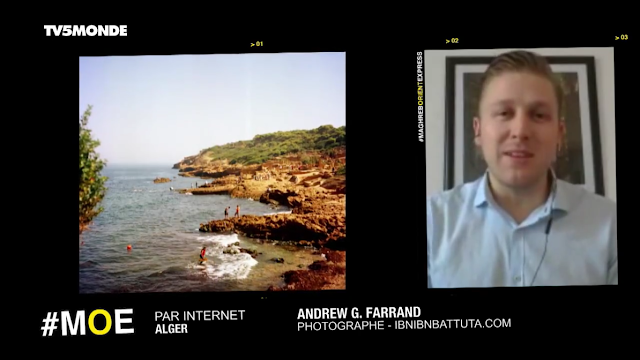 And this week I gave a live interview on France's TV5 Monde about a far less ambitious subject: my photography and my experience living here in Algeria. Thankfully only one of these appearances has made its way into the online zeitgeist and lucky for me—given my lousy punditry skills—it was the second. My interview opened the latest episode of TV5 Monde's "Maghreb-Orient Express," which is the international channel's flagship culture program aimed at audiences from and in the Arab world. The show's producers had contacted me earlier in the fall after seeing my Allaqta profile video to ask if I would like to take part. I only learned a few hours before the interview that it would be broadcast live worldwide—the ultimate French test! 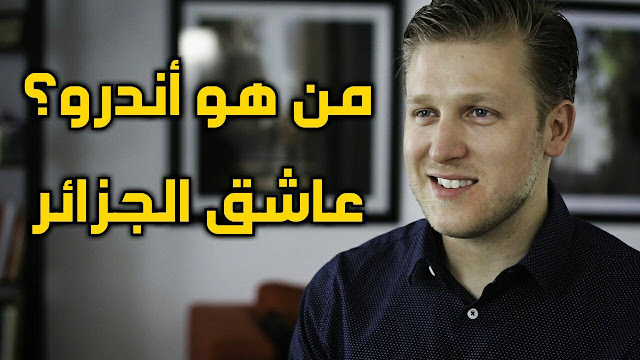 After the success of their first video profile on me back in August (which has since racked up over 1.2 million views between Facebook and YouTube) the Allaqta crew was getting a lot of questions. Where did you find this guy? Is he really American? What is he doing in Algeria? Does he really like this country? In short, who is Andrew? 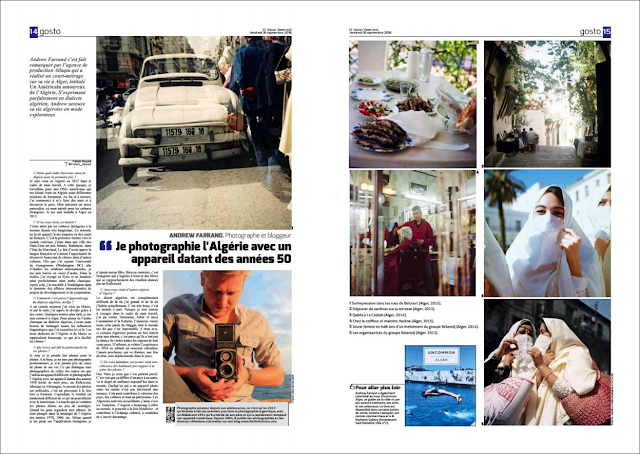 El Watan Profile: "I Photograph Algeria with a Camera Dating from the '50s"
This weekend's edition of El Watan, Algeria's most widely read French-language newspaper, includes an interview and profile of me, covering everything from my first visits to Algeria, to my interest in other cultures and languages, to my photography. My thanks go to the El Watan Week-End team, in particular reporter Faten Hayed, who conducted the interview and then adapted my rambling musings into a concise snapshot—and in much more elegant French than I ever could have managed on my own. "Hello Andrew, I hope you are well, are you available for an interview in Algiers? 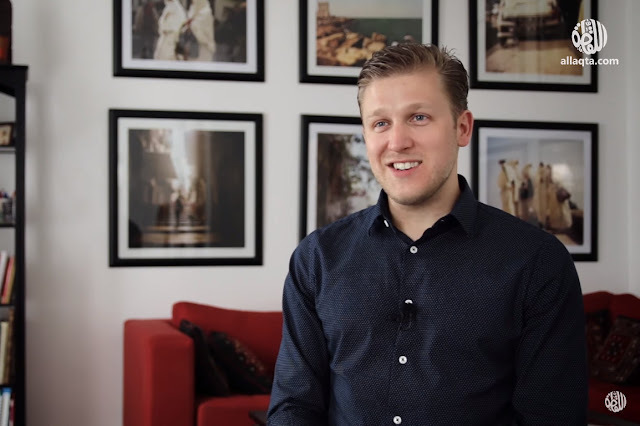 an interview about your work as a blogger and photographer." That was the message I received on May 29 that started it all. 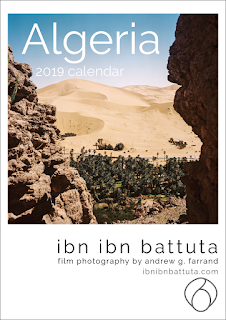 It came from Tarik, one of three young co-founders from the Algerian production company Allaqta (the name means "the shot", as in a TV shot, in Arabic). 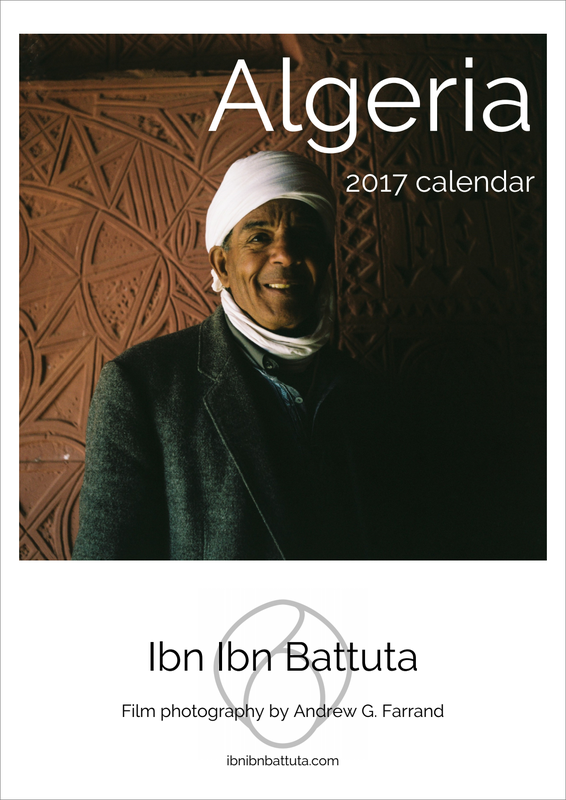 Three friends who grew up together in Algiers, Tarik, Mohamed, and Ibrahim, had launched Allaqta in 2015 in their spare time, alongside their day jobs in the TV business. By concentrating on producing high-quality, positive content about Algeria's natural beauty, historical sites, and popular culture, in just a year they had managed to quickly build up a massive following—half a million young followers on Facebook (the only measure that counts here in Algeria in 2016). French-speaking readers, there is your mysterious, enticing introduction. 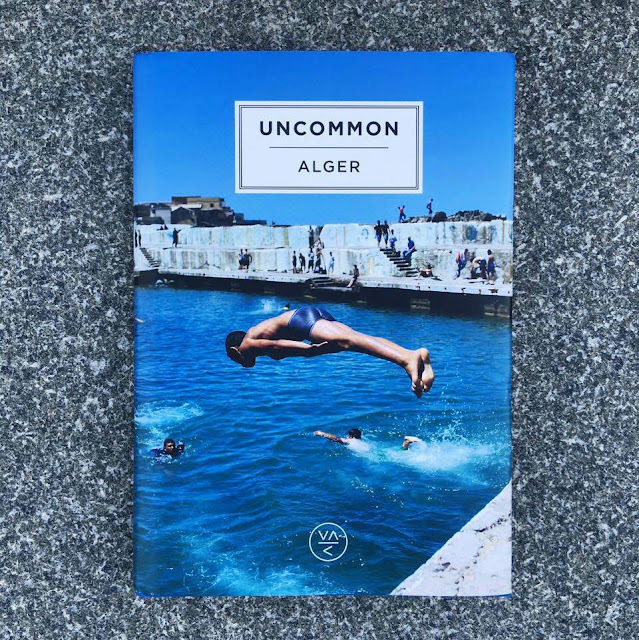 English-speaking readers, let me fill you in: This week I'm proud to announce that the newly published French-language Uncommon Alger is available for sale here in Algiers. I've just picked up my copy today and it is beautiful! Based in London, Uncommon Guidebooks publish just that—unusual guides to cities around the world that are as much travel guides as unique cultural artifacts in and of themselves. Filled with vivid photos, unique essays, artwork, comics, historical documents, and more, the books capture and convey the atmosphere of a place. The Martyrs' Monument, Algiers' most visible landmark, viewed from the Balcon St. Raphael in El Biar. Back in my mom's basement in Baltimore, somewhere in a crate full of foreign coins, postcards, and other odd trinkets accumulated from Middle Eastern souqs and African in my travels, sits a magazine article, its left edge ragged where I tore it from an issue of Smithsonian back in 2007. Titled “Save the Casbah”, the article is an ode to the famed Casbah of Algiers, and to the community activists, historians, preservationists, and local residents trying to keep the iconic hillside settlement from crumbling into the sea below. Out of fascination with this part of the world, I saved the article years ago, long before I ever visited the Algerian capital. Then, in 2012, I made my first visit on an extended work trip, and quickly fell in love. 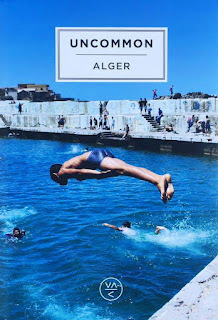 Within a year, I had successfully pushed for reassignment, leaving behind a comfortable life in the US to come explore Algiers' many twists and turns—both physical and unseen. Another great 2015 find: French photographer Julien Mauve's "Greetings from Mars" series, an alternately lighthearted and melancholy imagining of what space tourism may one day resemble.